Members of New York’s business development (BD) community gathered in AppNexus’ posh new auditorium to hear from a panel of companies that have all been acquired. The panel, Business Development Pre/Post-Acquisition: How my job changed, was hosted by BD Meetup and organized by Alex Taub (Dwolla) and Eric Batscha (AppNexus). From left to right: Eric Batscha (AppNexus), Scott Britton (SinglePlatform), Chris Watson (Savored), Drew Stern (Buddy Media), Jane Kim (Flurry), Maxine Friedman (Contently), Tanuj Parikh (GroupMe). “This panel came up because there have been a lot of NYC startups that have been acquired in the last twelve to eighteen months. The Pre/Post-acquisition panel wouldn’t have been able to exist, or at least would have looked very different if it had been held at the beginning of 2011,” says Batscha. In fact, only one of the six panelists was acquired before 2011 (see below). The panelists, all business development professionals, shared their acquisition experiences. Each panelist had unique stories and advice, given the different natures of each company and respective acquiring company. SinglePlatform was excited to “all of a sudden have a war chest of 500,000 clients to play with,” Britton told the audience. Kim said Quigo was thrown into AOL as “the stepchildren” because AOL had already acquired two other ad tech companies (and a fourth after Quigo). All of a sudden, Kim found herself among four presidents, four vice presidents, and nine VPs of Sales. Clearly, there was need for restructuring. Buddy Media was joined with Canadian company Radiant 6 as part of the Salesforce acquisition. Stern’s dilemma was that his new team had the same partners. “We had to figure out whose partnerships were stronger,” he recalls. Although sorting through contacts was frustrating, the process made Stern and his new team stronger. Some stories, however, had common themes. The panelists agreed that learning how to navigate the process of a big company is important. For Watson, quick iterations now took longer, as being pushed through other departments slowed the process. No longer was he in a startup environment, where suggesting product changes meant walking down the hall and knocking on a co-worker’s door. Parikh was also affected by working with new departments. “Every time the contract is about to be signed, another lawyer is cc’d in the email thread. I never know why,” he bemoaned. The panelists also stressed the importance of building and maintaining relationships with new co-workers, especially executives and influencers. “As a BD person, you need to try to figure out who’s really running the show. You need to ask discovery questions,” Friedman advised. 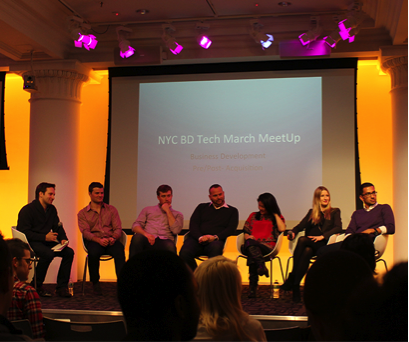 The next BD Tech Meetup is tentatively scheduled for April 15th. Be sure to keep up to date with the upcoming events in New York by visit the AlleyWatch calendar.